Kilim rugs are flat-woven rugs with stunning geometric designs that were traditionally made in Turkey and Persia. The recorded history of kilims dates as far back as the 13th century when Marco Polo, the famed Venetian explorer, wrote about their great beauty, however the first looms were likely created around 10,000 B.C. or earlier. Artisans have passed down the tradition of weaving kilim rugs for hundreds of generations, and collectors have long prized these rugs for both their beauty and durability. Considered to be works of art, kilim rugs are enjoying a resurgence in popularity, and there’s good reason why. They are ancient in tradition, yet modern with their bold and appealing geometric patterns. They make a statement, while also being adaptable to almost any design. And they are affordable while also being collectible. But with so many options available, buying a kilim rug that is perfect for you and your home or collection can be overwhelming. This guide to buying a quality kilim rug will help make sure that you get the right kilim for you. It’s the tightly woven warp and weft strands that create the flat look of the kilim rug, with no pile. Horizontal weft strands are pulled tight enough to hide the warps strands. While the weft strands, which create the visible design, are almost always wool, the warp strands are either wool or cotton. However, if you want the highest quality kilim, look for a kilim with both the warp and weft strands woven 100% from wool. Traditional antique kilims have symbolic meaning woven into the geometric patterns and motifs. Kilim weaving was historically done by tribal women, with the rugs being part of their dowry and also a source of income. The symbols woven into the rug often represented the wishes of the weaver, such as symbols of motherhood and fertility, protection for family and possessions, and safety from danger. When you buy a kilim, these symbols can be the key to knowing where the rug was made, how it was made, and by whom. All of these factors are important when you are determining the value of the rug, and a reputable rug dealer will be able to provide you with the background and history of the kilim, without pressuring you to buy. It takes a fair amount of expertise to know a quality kilim, so choosing a dealer that you trust is crucial. You will be counting on your rug dealer to be fair and well-educated, because it is impossible for a new buyer to have all the knowledge necessary to make a good investment in a kilim. As times have changed, so have kilims. Along with the antique rugs, high quality modern kilim rugs are also being developed and taking their cue from the best aspects of the vintage variety. These modern kilims have the same flat weave and natural fibers, but their geometric designs are pushed to a more abstract style to be compatible with the rising interest in post-modern interior design. 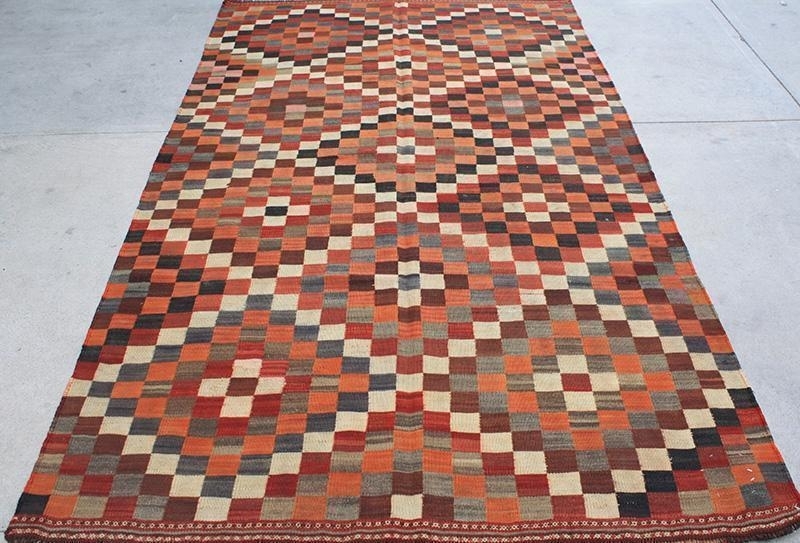 Again, you will want to rely on a reputable dealer to introduce you to some of these more modern kilims, so that you can be sure that you are getting the proper value for your investment. Speaking of investment, it’s the lack of the pile that actually makes the kilim rugs more affordable. Although they were at one time thought to be inferior and more primitive than their pile counterparts, kilim have become much more collectible in recent years, and high quality pieces can command high prices, up to thousands of dollars, while more affordable versions start at just over $1000. Antique and vintage kilims were produced in tribal villages, using vegetable dyes and wool, and resulting in unique, one-of-a-kind carpets. For instance, in Turkey alone, there are dozens of distinctive types of kilims, from the various regions. And kilims aren’t isolated to Turkey and Persia. Thier designs have appeared in places as far flung as China, Scandinavia, and Hungary. Around the time of the Victorian era, nomadic tribes were settling down and rugs lost their tribal character, synthetic dyes were developed, and mass export turned the production of carpets from personal to professional purpose. Thus, the antique rugs became more highly valued. It is these three factors--all wool, one-of-a-kind, and vegetable dyed--that contribute to the overall value of the piece. It is the distinctiveness of the kilims that have contributed to the value of these rugs, and as the modern world has become more homogenized, the older kilims have become more and more prized for their one-of-a-kind designs and soft vegetable hues. As current collectors develop more appreciation of a nomadic, the tribal life that produced these carpets and has all but disappeared from our planet, and it is no wonder that the vintage rugs have become more valued collectibles. Interestingly, the same timeless geometric designs that may have represented the wishes of a young, nomadic bride have the same appeal for new homeowners and collectors alike. Whether you choose a vintage or modern kilim rug, proper care will keep it in good condition, extending its life and enhancing its beauty. When you vacuum, use a low suction setting and be sure to vacuum both sides of the rug. The tight weave can cause dirt to become embedded on both sides of the rug, so it’s important to clean both the front and back. Word to the wise: Don’t vacuum the fringe, as it can cause breakage. For liquid stains, the tight weave of the carpet works in your favor. First scoop up the liquid with a spoon, rather than immediately blotting and thereby pressing the spill into the weave. Gently blot away any remaining liquid on the rug and floor. Put a tray under the rug and pour some clean water through the weave to remove any remaining stain. If it is still stained, take it to a professional rug cleaner to avoid worsening the stain. If you have your kilim professionally cleaned, be sure to choose a cleaner who specializes in cleaning vintage kilims--not your local dry cleaner, who may use chemicals that could damage the sensitive vegetable drys. At home, use a half-cup of vinegar diluted in a pint of cold water and brush over the carpet to brighten the colors, and never, ever put the rug in the washing machine. For more information on kilim rugs and many designs to consider for purchase, please visit the Rug Warehouse web site orour Los Angeles showroom to view our outstanding collection of vintage and modern kilims and to work with an expert professional to choose the best kilim rug for your home or collection.